This post is dedicated to my dearest, life-long friend, Judy, and my mother-in-law, Shirley. These incredible women found out within a few weeks of each other that they have breast cancer - their courage amazes me every day and I love them both dearly! In general, the following items are good basics to have on hand when you are making clay jewelry or really, any clay project. Clay: Before you can make clay jewelry you will need clay. I'm a big fan of Sculpey. If you go to a craft store like Hobby Lobby or Michaels you'll find Sculpey plus a few other brands like Premo and Kato. 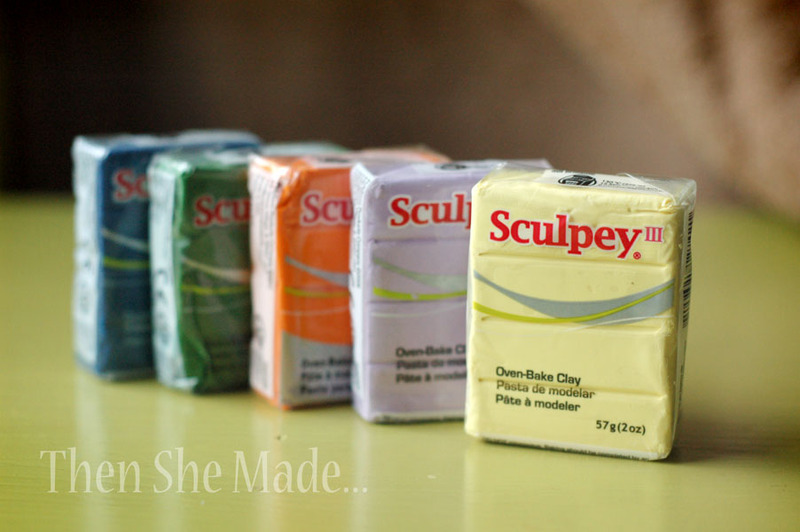 Sculpey is the least expensive of the brands you'll find. The other brands claim to be superior but I've tried them and I always end up going back to my Sculpey - I like it better but you can get whatever fits your fancy - it will all work about the same. Just some minor differences and no, I'm not sponsored or paid by Sculpey! Although I wouldn't mind being - Sculpey people, if you're reading this... oh, anyway, back to the tutorial. 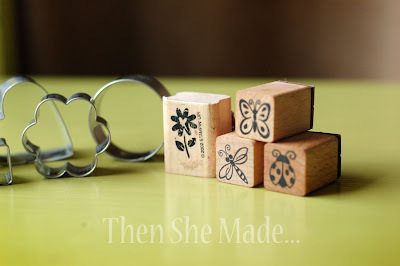 Stamps: I like to use stamps to make the designs in my pendants. Any stamps will work. I have a ton of wood mounted stamps from my scrapbooking days that work great. I've also used my acrylic stamps too - be creative here, if you find things with interesting patterns use it. 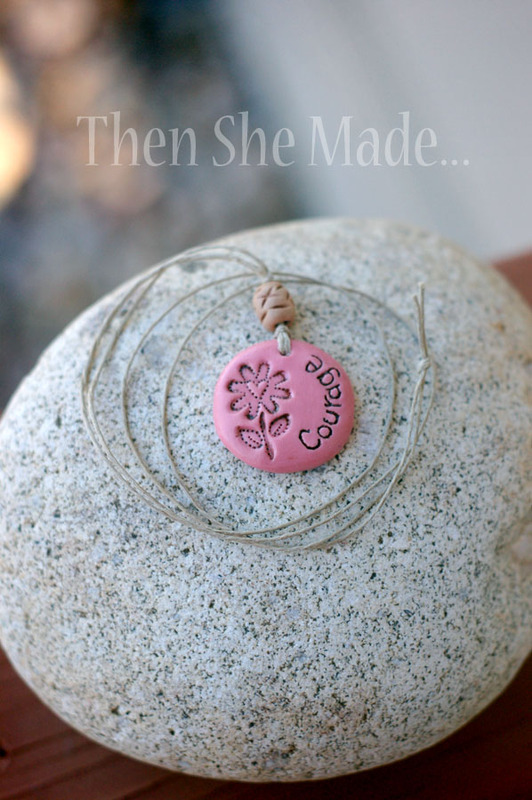 The very first clay jewelry piece I ever made was done using the bottom of my daughters shoe - it was awesome, great design impression. Just don't limit yourself, think outside of the box. Cutters: Shape cutters will help you get a perfect shape. You don't need them - you can sculpt you shape free-hand and get great results. I like to do that often but for this tutorial I'm using a circle cutter. You can buy them in the clay aisle at your craft store but don't limit yourself there, also look at cookie cutters and other things. The cutter I'm using today is actually an apple corer. *** - just an FYI - Sculpey is non-toxic, however, if you use a kitchen item on it, don't put it back in you kitchen to use on food. The clay leaves a slight residue on things and so if you use a cookie cutter on your clay, dedicate it to a clay-only cutter from then on. Stylus or sharp pokey-thing (that's what my girls call it): You will want something like this to help you with your design and also to add the word to your pendant. If you don't have one, don't worry, just use a tooth pick. The photo above shows the majority of the items I'll be using for the Courage pendant. 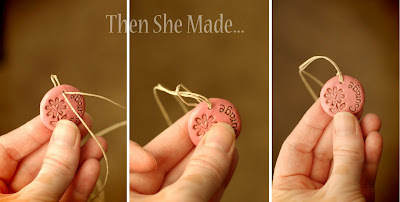 If you make your own, you will need the above mentioned items (clay, stamp, stylus, cutter) as well as the following: wax paper, small paint brush, paint, Mod Podge, and string/hemp for necklace. Step 1: Lay out a piece of wax paper. This will be your working surface. As mentioned above, clay is non-toxic but you want to keep it away from any areas that touch food. It leaves a little residue and the wax paper will just keep things clean on your working surface. Step 2: Pick your clay color and break off a piece. Clay needs to be "conditioned" so you need to knead it for a few minutes to get it soft and workable. Once it is soft, roll it into a ball and then press it out flat. Keep it all a consistent thickness. If you have a pasta machine that you use for crafting, you can run your clay through that a few times to get a really smooth surface. Sometimes I'll do that but I didn't on this pendant. I like the hand-made look. Step 3: Next, grab your stamp and make an impression in the clay. You don't want to press so hard that you see the edges of the stamp base but you do need a good, deep impression. 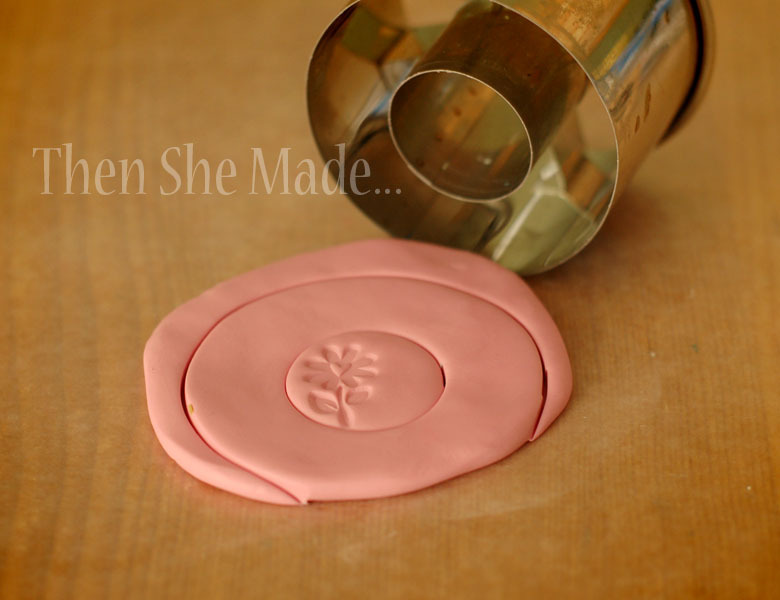 Step 4: Use a cutter and cut your clay into the shape you want and then carefully remove the excess clay. Step 6: Once your word is done, add anything else you want to your design. I added some dots in my flower to give it a little more detail. Also, make sure you add the hole for the string at the top of your pendant. When you have it how you like it, set it aside. Step 7: Next we are going to make the bead that sits at the top of the pendant. Do this by shaping a small piece of clay into a small ball. Then shape into the desired form for a bead. Next, poke a hole through the center. Make sure the hole is big enough that your twine or hemp can thread through it. Step 8: Add any details you want to the bead. I used the side of my stylus and made random hash marks to give the bead some texture. Step 9: Not shown: Pre-heat oven to 275 degrees and bake your clay, both the pendant and the bead, for 15 minutes. (Different clay brands have different cooking instructions so read the label on your package) Also, it is wise to use a disposable pan or dedicate one cookie sheet to just clay projects - remember, you don't want your clay to touch surfaces that also touch food. Step 10: Once they are done cooking, let them cool completely! Step 11: Take a little paint, just craft paint works great, and very carefully add paint into the stamped impression. Then with a damp paper towel or rag, quickly wipe most of the paint away. **You want to do this step quickly or else the paint will start to stain your clay. 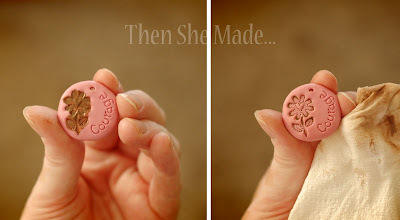 Do this for the stamped impression, the word, and also the small bead. If you wipe off too much paint the first time, just repeat the process until it looks like you want it to. I like mine to have just enough paint to show the depth of the design. Here they are after the painting step is complete. Step 12: Next I add a protective coat. I've tried various products and I usually just end up using plain old Mod Podge. I like the semi-gloss look and I've found that a lot of other products, even those meant to be used with clay, peel off after awhile. 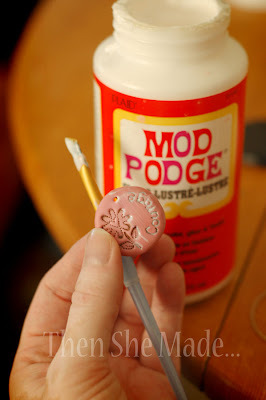 Once you add the Mod Podge, let it dry. Step 13: We're almost done. Now you just need to put the necklace together. Take a long piece of hemp and fold it in half. Thread the folded end (the middle of the string) through the hole in the pendant. Then tuck the remaining hemp through the loop that the fold makes after it's threaded through the pendant. Then simply pull tight. Step 14: Next you just thread on your bead and tie the two ends of hemp together - then you wear it! If hemp/twine isn't your style, use a jump ring and a chain. Either way it will look great. 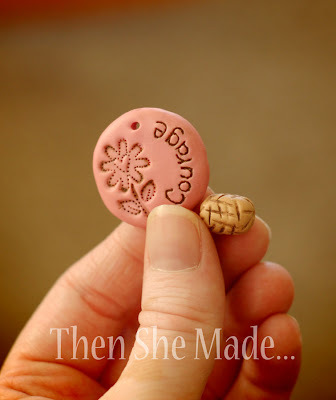 So, there you have it, that is how you make a word pendant out of clay - hopefully it all made sense. Thanks so much for posting this. I am sort of intimidated by clay but you made it look super simple! So cute! I love the idea of using the stamp. Oh goodie! You did a tutorial!! I saw your previous post and just had to know how you did it! So thank you for posting this! Wow this is really neat and fun looking! Have to try this sometime! Great tutorial! Love this necklace for the YW! This is a really awesome project! I am a site manager on Instructables.com. You should consider submitting this as an entry to our Play with Clay Challenge. We're giving away an We're giving away hundreds of dollars worth of Sculpy clay and tools. So I tried this project today. Super cute, except my words! It looked like my 6 year old wrote it. Do you have any other tricks for this? So cute and easy! Thanks! Very cute! What can you use to make these waterproof so they can be worn all the time? Oh, this is awesome!!! I love it! How adorable, easy, afforable and fun! I can't wait to try this. I absolutely love this! I recently became a cancer survivor, but not sure I''m crafty enough. Do you sell them? @ Tarin, She does sell them on Etsy. There is a 'custom jewelry' tab at the top of the page. Beautiful! I love them and would love to try making one. You are very talented. 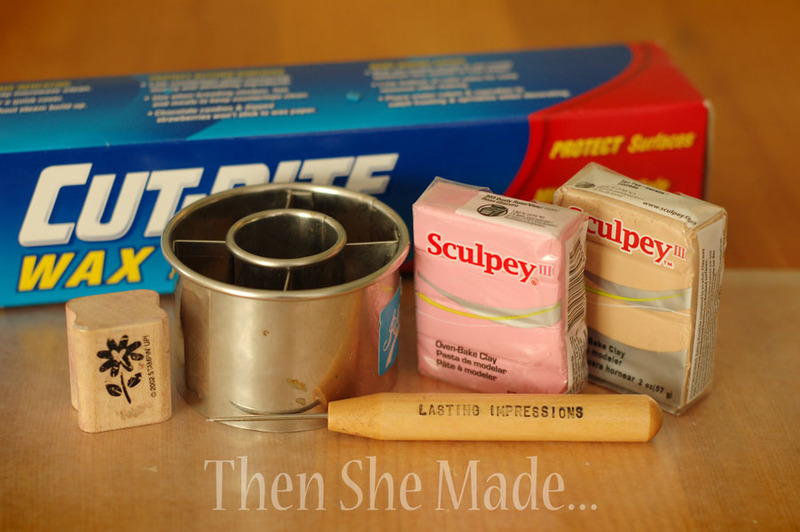 I've never used Sculpey but your tutorial is so detailed, you make it sound easy! Thanks for taking the time. Thanks for the tutorial. I like too. It's a great product and it's made in the U. S. A. Buy Sculpey, keep Americans working. LOVE THIS! Makes me want to make a zillion of them, for myself & for gifts! I love this idea! I work with a youth group at my church and want to make these as gifts for our girls. Do you know about how many pendants you can make with each package of Sculpey? Thanks. it really depends on how thick you make them. I tend to make mine fairly thin so I can usually get about 8 per package. Just don't make them too thin or they will break easily. I'm also looking to do this as a YW camp craft. I haven't worked with the clay before and am wondering how long it keeps wrapped in the package? Does it eventually dry out? AC Moore (a New England craft store chain) has it on sale for .88/package this week so I'd love to grab it now but our camp is not until August. What do you think? I am interested in making these for girls camp crafts. Can I get the tips too? Thanks for the tutorial! Looks fun and easy! Love the necklace. Best Wishes. Thanks so much for sharing this how-to. I am pinning it to do as a craft with my daughter. How long would this project take from beginning to end? Could it be done at a Wednesday night activity(1-hr.)? Where can I buy a stylus or pokey-thing? When I put a search in for stylus, I am only getting the ones for ipads, etc. search for stylus in like art areas where they do ceramics. Or, the one I use is actually a scrapbooking tool for paper. I think they call it a piercing tool. Love it, so pretty yet so simple! Guess I have my Christmas presents for my little cousins lol......excited to try this! This is so cool! I think I might try this! This was the best tutorial I've ever seen and you make it so easy to follow with your step by step instructions. I'm a cardmaker so I plan to use these as charms added to my cards. I need them thin, I hope it won't cause them to break cutting them thinner. Again, this is just what I've been looking for. Thank you for sharing. I`ll make this for my daughter`s birthday. It will be great as a gift for the girls. Silly question... this clay can be baked on regular oven correct?? Yes, just a regular oven is fine. Be sure to layer your pan with a piece of paper first, I just use printing paper but you could use parchment if you have it. Good luck! Thanks Amy for your help. I'll give it a tray and see if it works. I'm hoping you can help me. all my lil circles are sticky from the mod podge! Any ideas? I've made and mod lodged about 50 of them so far! Need help before I continue on. I've got lots to make! Great tutorial! Have you tried using a word stamp instead of writing your own word by hand? Awesome tutorial!! I want to caution folks baking in the oven though. Polymer Clay has plasticizers in that will leave a coating in your oven. I have a cheap toaster oven used just for baking clay. You can use your oven, but put a tent of aluminum foil over top to prevent the plasticizers from getting all over your oven! Thanks for sharing! I'm going to attempt to make a pendant that's a letter xD Not sure if it will work but I will give it a shot! I've never worked with clay before. I've heard it expands when you bake it or it may crack...does that happen? If I'm trying to make a letter B for example...I don't want it to expand and look distorted! Also...is clay fragile after it's baked? I love this but I curious about mod podge. I made it but it stinking because the mod podge. Is that normal?